Is there any truth to the five-second rule? You know, that guiding principle we use when our food drops to the floor and we pick it right back up and eat it. As long as it hasn't been on the floor for more than five seconds, we're safe. Right? 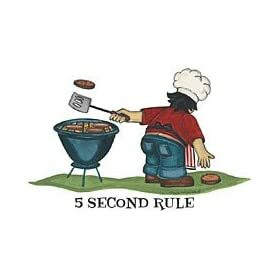 We actually have longer than five seconds, says Anne Bernhard, assistant professor of biology at Connecticut College, whose students put this rule to the test. Bernard and her team dropped apple slices, a wet food, and Skittles, a dry food, on a cafeteria floor -- which incidentally had been smeared with E.coli -- and then measured the results. Their conclusion: Moist foods are probably safe for 30 seconds, and dry food can stay on the ground for one minute. And that's with E.coli in the mix. So the five-second rule appears to be legit -- if you trust this study, that is.